Taper week is here, at last! I'm not sure which Spandits I'll be wearing this Sunday.... maybe these? I am positive I'll start to get the crazies this week - but for now, I'm surprisingly calm. We'll see how I really am come this Thursday or Friday! Let's talk about training. I chose to follow the Hanson Plan this marathon cycle...mostly because the last time I trained with it, I PR'ed at Sugarloaf. I wasn't looking forward to all of the speed and longer mid-week runs. To me, they seemed rather anxiety provoking.... How on earth was I going to fit them in? Somehow I managed to get them in - thanks to my fabulous support crew. Don't you think LL Bean should use this? I'm completely in love with this photo by a sweet and talented friend! Thanks to Gore, I've had excellent gear to train in as well. 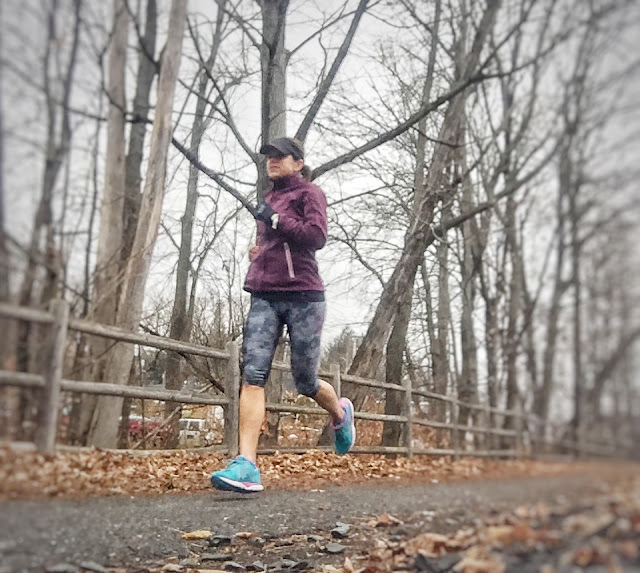 I see LOTS and LOTS of miles in this warm gear as the temps drop....and then even more miles in the GoreTex Brooks Ghost shoes when the snow starts flying. Not a Brooks fan but want to see which shoes are GoreTex? Check out the link here! I've never tried anything from the GORE apparel line. Now I'm hooked. The jacket is amazing. I would wear it every single day - to school/errands/running - you name it. It's a perfect fit, flattering, purple and warm but light weight. Perfection. And the hat and gloves are amazing as well! First, you cannot go wrong with a simple black hat or gloves. They match everything. Second, they both fit perfectly. The only thing I would change about the hat would be to add in a pony tail "hole" because my hair isn't that long and I looked like I didn't have any hair when I put my hat on over a pony tail. But really - it isn't the end of the world. It felt great and kept my head warm - so it's all good! or these? Or maybe even a different pair all together! But I will be wearing Spandits!!! You know what? I've already surpassed my previous yearly mileage PR (used to be 1600 miles) with 1601.8 miles for 2015. Of course this is taper week and I'll be taking some time to recover post Philly, but there is still lots of time left in 2015! disclaimer: I received an entry for the Gore-Tex Philadelphia Marathon and gear to review. I was not required to post a positive review. As always, all opinions expressed on my blog posts are 100% my own.